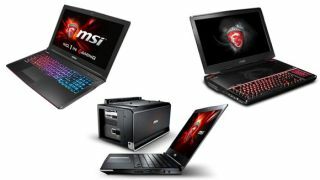 MSI brought its gaming muscle to CES 2015 this week, debuting the GT80 Titan SLI, which it claims is the first gaming laptop with an integrated mechanical keyboard. The Titan has a SteelSeries-designed mechanical keyboard with clicky Cherry MX Brown switches, and it also comes with easily upgradeable dual NVIDIA GTX 980M GPUs in SLI and dual NVIDIA MXM graphics cards. It supports up to 4 M.2 SATA solid state drives in RAID 0 and 32GB of memory, and includes an efficient dual fan cooling system. MSI is also showing off the GS30 Shadow, a gaming laptop that becomes "insanely powerful" when connected to its Gaming Dock, and the AG240 4K All-In-One gaming PC, a high-spec'd rig it says is the world's first 4K all-in-one gaming PC. Finally MSI also brought the latest update to the GE62 Apache, with GTX 965M & 970M graphics, a dual exhaust system, and a SteelSeries gaming keyboard. The new Apache has 46% better battery life compared with previous models, the company says. The Galaxy S4: an oldie but a goodie?